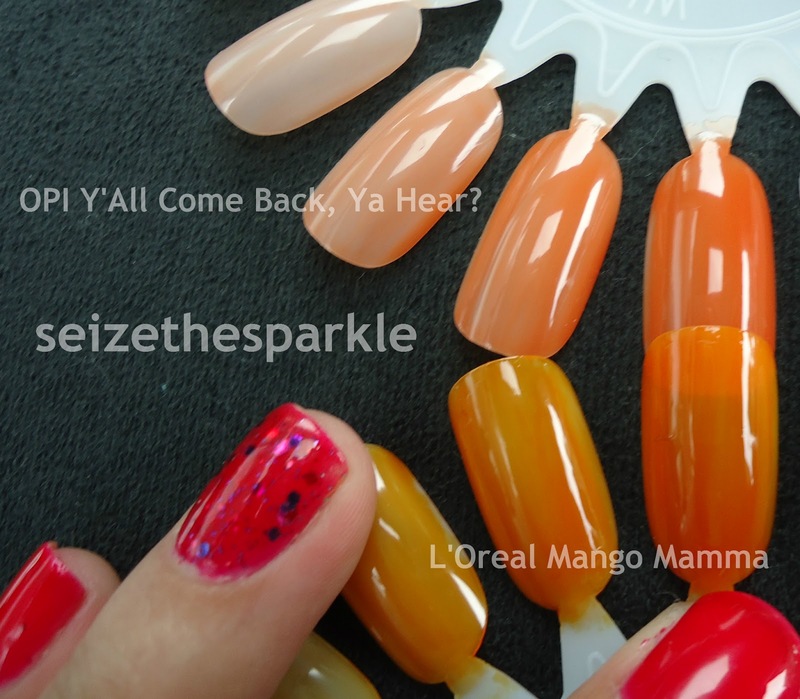 L'Oreal Mango Mamma vs. OPI Y'All Come Back, Ya Hear? Looking at these swatches... It's evident I should've also taken bottle shots of these two! When you compare them that way, they look like they'd be identical. Y'All Come Back, Ya Hear? is from the OPI Texas Sorbet Collection. I'm not a lover of orange, but it was 50% off, and for OPI, that's a steal! Y'All Come Back, Ya Hear? is a cool shade of orange... pumpkin-y orange to be precise. L'Oreal Mango Mamma is just what its name implies. A Mango-licious Tangerine-ish warm orange that I actually kind of like. I'm not too sure that it would look right with my skin tone, but I love the depth and saturation of Mango Mamma! It would create a beautiful Jelly Glitter Sandwich! If you were looking to cross one of these polishes off your wish list... I'm sorry to say I can't help with that! These are different enough to warrant owning both. Given the fact that the OPI Sorbets came out in 2011... you'll probably have an easier time picking up Mango Mamma from L'Oreal. L'Oreal polishes are a little less expensive than OPI, too... They retail at $5.99 a bottle, compared to the $8 or so for OPI polishes. Mango Mamma from L'Oreal is part of the Miss Candy Collection for Spring 2013. Miss Candy is a Limited Edition Collection, so I wouldn't wait too long to track down any of these polishes. Jellies like this won't hang around forever! Which polish from the Miss Candy Collection are you looking forward to most?!? Tags : Jelly, L'Oreal, OPI, orange, VS.